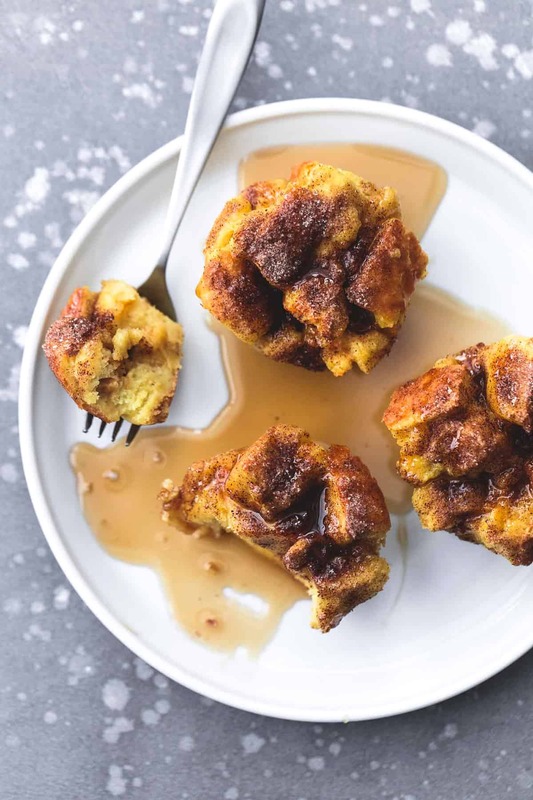 Baked Cinnamon French Toast Muffins are quick, delicious, and fun for the whole family with a cinnamon sugar topping and easily frozen for on-the-go breakfasts! Easy breakfasts are our lifeblood around here. 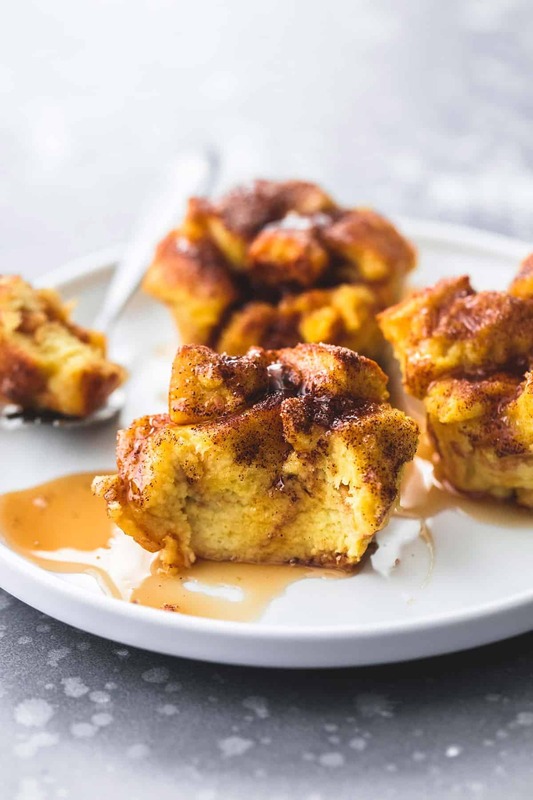 If you can relate, try Blueberry Cream Cheese French Toast Muffins, Baked Croissant Breakfast Sandwich, and Overnight Cinnamon Roll French Toast Casserole. This post is sponsored by Horizon Organic – all opinions are my own. Say hello to my new favorite breakfast! Not only is it incredibly delicious, but it pleases the whole family – even my picky toddlers! – and can be frozen and reheated for individual breakfasts on the go. And it’s FRENCH TOAST in a cute little MUFFIN. What’s not to love here?? These tasty little breakfast beauties are made in about 35 minutes and only call for 6 – that’s right SIX – ingredients. You’ll want to use thick sliced Texas toast style bread for this recipe. That’s my number one tip for soft and fluffy, never overly dense, French toast muffins. Slice the bread into cubes and place it in a large bowl. Next you’ll whisk together eggs, vanilla, sugar, and some Horizon Organic Whole Milk and pour it over your bread cubes. 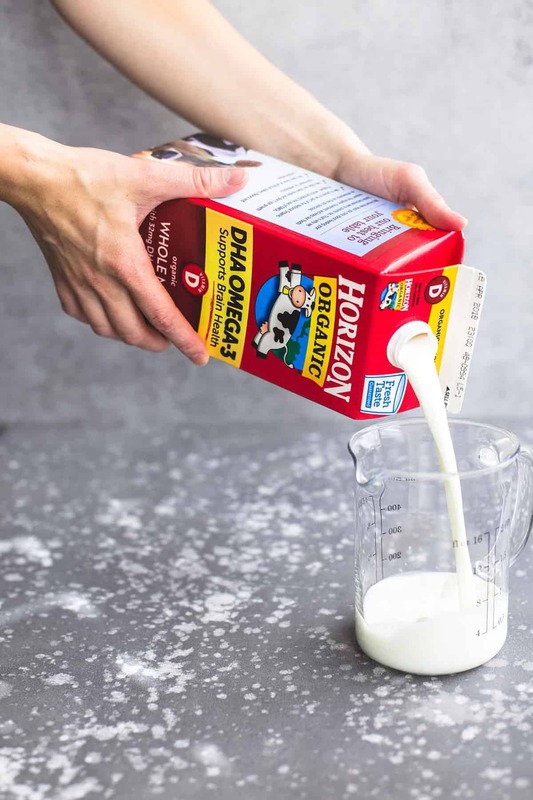 I encourage my family to live a healthy lifestyle by fueling them with ingredients I know are delicious and nutritious, like Horizon Organic Milk. Knowing I’m packing wholesome goodness into these French toast muffins makes me that much happier about my family devouring every last one from the batch. Once you’ve got the bread and egg mixture all tossed together, fill your muffin tin, being sure to pack each one really full – don’t be afraid to let the bread cubes extend above the pan, the higher the better! Sprinkle cinnamon and sugar over the top (my favorite part!) and bake for about 20 minutes until golden brown and your kitchen smells like cinnamon-sugar heaven. Drizzle with syrup or sprinkle with powdered sugar for the ultimate family-friends breakfast treat. Let any extras cool completely before wrapping and freezing for quick and easy individual breakfasts throughout the week! 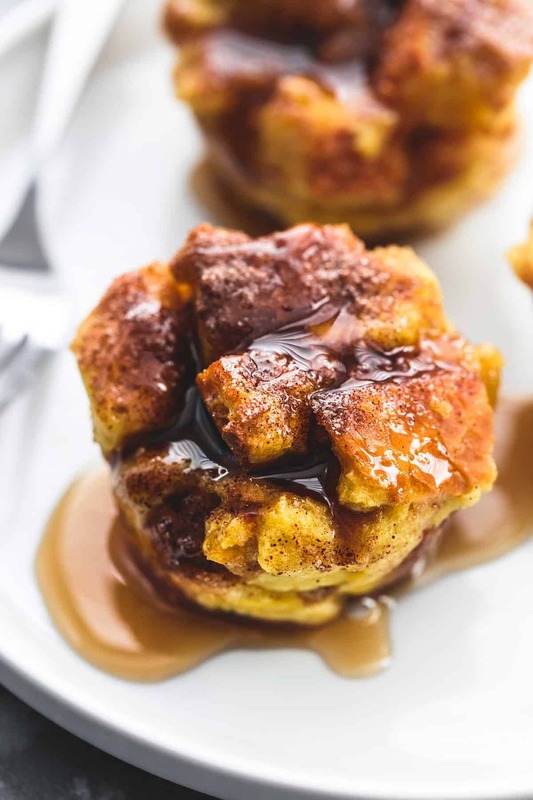 These Baked Cinnamon French Toast Muffins are completely delicious and so easy to make, I know you and your family will go nuts for them! Preheat oven to 350 degrees and grease a 12-cavity muffin tin. Cut bread slices into cubes and place in a large bowl. In a medium bowl whisk together milk, eggs, vanilla, and 3 tablespoons sugar. Pour over bread cubes, then gently stir to coat all the cubes in the egg mixture. Fill muffin tins with soaked bread cubes, packing gently to fill all of the cavity space. In a small bowl whisk together remaining 3 tablespoons sugar, and cinnamon. Sprinkle over muffins. Bake for 20 minutes or until golden and bake through the middle. Serve warm topped with powdered sugar or syrup. To freeze for later, wrap individually in plastic wrap. To reheat, unwrap and microwave for 30-60 seconds. Am i just overlooking it but i don’t see how many eggs in the ingredients? Hey Laura- sorry about that! My mistake. I’ve fixed it. I used 6 eggs. Hi Tammy- My mistake! I fixed it! I used 6 eggs. 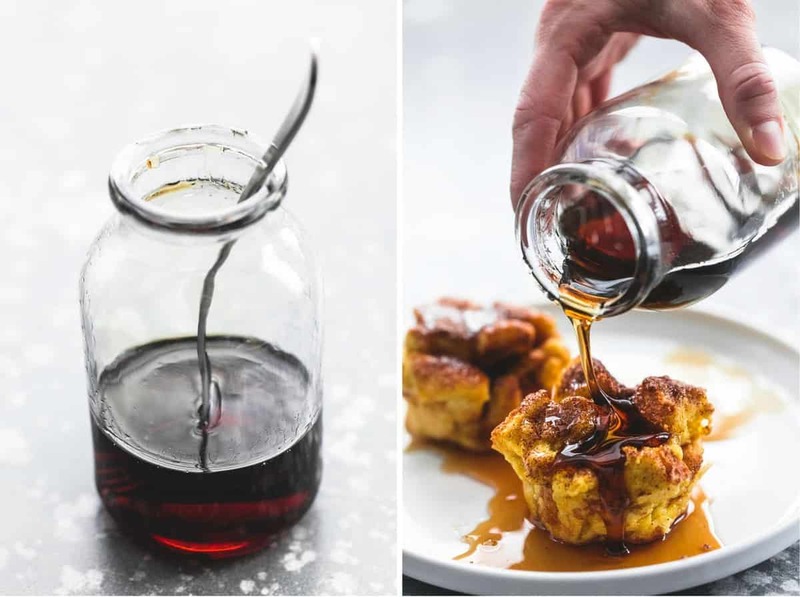 Could you also fix the french toast muffins in a 9X13 casserole pan? If so, How wOuld you Alter tHe recipe? Hi Kim! Yes, the french toast can be made in a casserole pan! You will just need to increase the baking time by maybe 10-15 minutes until the center is fully cooked through and no longer gooey. Hi Jared- That was my mistake! I used 6 eggs! Hello, you forgot to list eggs in the INGREDIENTS, as in how many? Hi Fran- My mistake. I fixed it! I used 6 eggs. Thanks Tiffany! Looking forward to making these little gems this weekend! hey girl- this looks very yummy! When you say “Texas Toast style bread,” where should I look for it in my grocery store? I have only bought frozen garlic texas toast, and that surely is not what you used! Karen, definitely don’t use the garlic toast! 😉 Texas toast is just a thick sliced white bread! aBOVE THE RECIPE YOU SAY TO WATCH THE VIDEO. wHERE DO i FIND THE VIDEO? 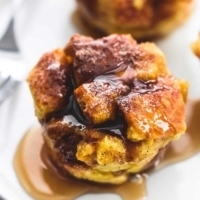 It is directly above the recipe on the Cinnamon French Toast Muffins webpage! I Made these little bEauties for brunch today and my 3 grandsons and hubby LOVED them! I made halF into muffins & the other half into mini lOaves and both turned out fantastic! I will be freezing the leftovers & can’t wait to see how they freeze for work later this Week! Hi Samantha! I am SO happy to hear that you loved these! I just died at the thought of them in mini loaves! So cute and so delicious! 😉 Best leftovers, ever. Enjoy! Could this be modified and Made with whole wheat bread? Just remember, the thicker slices work best for this recipe! No- regular milk will work just as good! Both sounds delicious! Great ideas. Thanks for sharing! Glad you love it. I made these yesterday with some leftover crusty rolls. They were fabulous and we all loved them! There are several “mini muffin sizes. I myself have two different mini muffin pans. I might be the only fuzzy head who doesn”t understand, but it surely would be helpful to know what mini muffin size (ounces? inches?) you used in this recipe. I”m looking forward to making these. I”ve made several of your recipes, and I”ve never been disappointed. The pan that I used has 12 cavities in it! I believe they are about two inches across. Hope this helps! Are these Freezable? Looks like a great idea for a quick breakfast. Hi Laura- Yes! They are for sure freezable! They heat up like a dream and make for a good quick, on the go if needed, breakfast! Thank you for this recipe! I made this tonight and it was a huge hit. I couldn’t find Texas toast style bread, so I used almost all of a loaf of french bread from my store’s bakery department. I will definitely make this again! Perfect!! Great idea! Any bread can be used as long as its sliced thick! So happy to hear that you loved it! Thanks for sharing! This looks yummy!!! Iknow what Texas Toast Is; i buy it fairly often; however, in watching the video, the bread you use looks a pale yellow in color . . . almost like a sweet bread. is it, or did you use just ordinary white texas toast? Thank you!!! Hi Jean- it’s regular white bread but it did have somewhat of a yellow color! It was just the brand of bread that I used while filming the video! 🙂 I hope that you love this recipe! Could i use leftiver donuts instead of toast? thank you! I run a bakery and want to use my day old donuts, will post a picture when i do!! I didn’t find this to be very tasty. However, it was dry and difficult to get out of the muffin tin. And yes, i followed the recipe. Sorry to hear that you didn’t have a great experience with this recipe, Becky. Thanks for your input!